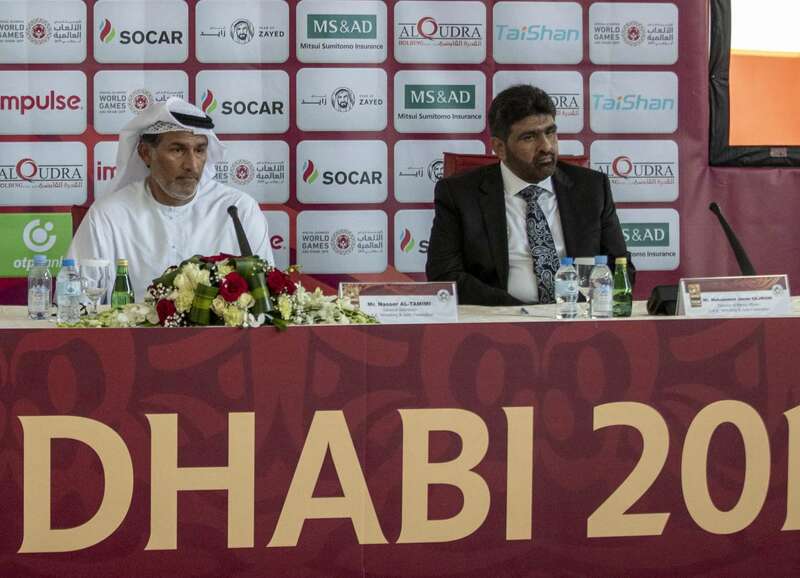 The Abu Dhabi Grand Slam 2018, the fourth Grand Slam of the season, will take over the sporting world landscape from 27 – 29 October on a weekend where the sport will also be celebrating #WorldJudoDay and the theme of Friendship on Sunday 28 October. The crown jewel of the IJF World Judo Tour, the World Championships, is still an indelible memory for judo fans and the media alike but the world of elite level judo is constantly moving. Since September’s Worlds in Baku, Azerbaijan, the stars of the thriving Olympic sport visited Mexico for the Cancun Grand Prix and now the stage is set for the penultimate Grand Slam of the season. Grand Slam events have been held in Paris, Düsseldorf and Ekaterinburg already this year with Osaka still to come in November. IJF Head Sport Director Mr. Vladimir BARTA announced the impressive competition figures before conducting the draw on Thursday afternoon at the competition venue. 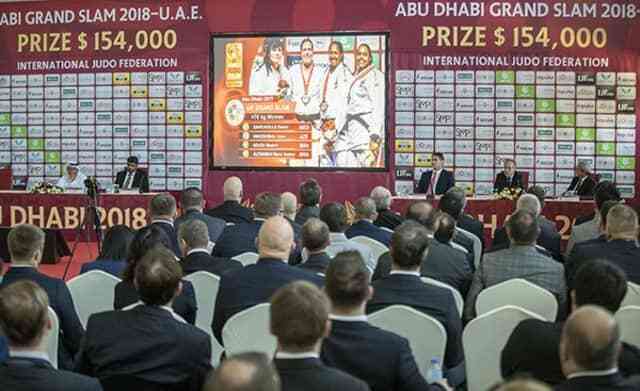 Abu Dhabi will see 348 judoka from 62 nations in action over the next three days including Olympic champions Lukas KRPALEK (CZE), Paula PARETO (ARG) and Majlinda KELMENDI (KOS). Mr. Mohamed MERIDJA (below - centre), IJF Education and Coaching Director, made the opening address on behalf of IJF President Mr. Marius L. VIZER. Kosovo superstar KELMENDI has not fought since 2017 due to injury and in her absence her teammates have more than stepped up and kept their country moving forward on the tatami with European Championships, Grand Prix and Grand Slam gold medals. KELMENDI is a flag bearer for her country on the world stage and her anxious wait to return to action is finally over with the double senior world champion set to compete on day one in Abu Dhabi. Click here to watch a new documentary on Majlinda KELMENDI by the Olympic Channel. 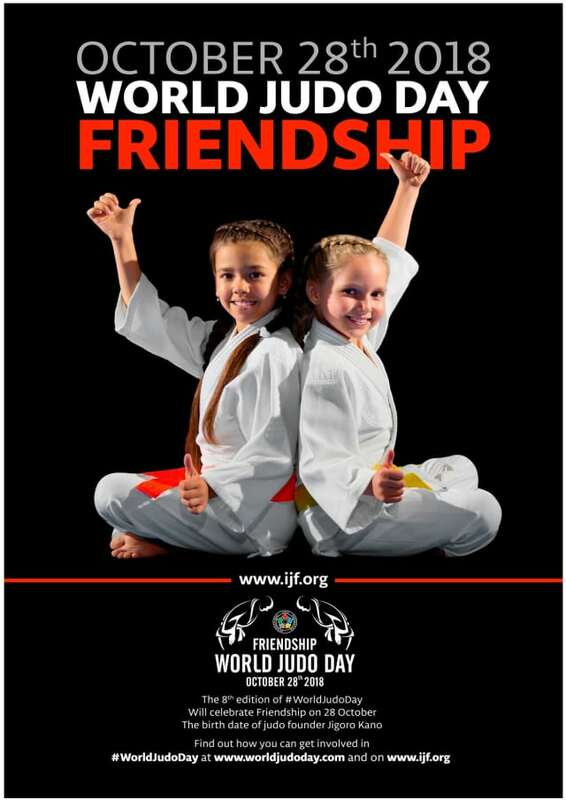 The International Judo Federation will host the eighth and most anticipated edition of the annual #WorldJudoDay on 28 October with FRIENDSHIP selected as this year’s theme. Previous themes were COURAGE (2017), UNITY (2016), HONOUR (2014), PERSEVERANCE (2013), JUDO FOR ALL (2012) and RESPECT (2011) for the day which is dedicated to coaches, fans, judoka and everyone with a passion for one of the world’s most widely practised sports. The theme for 2018 was decided by polls on Twitter and Instagram as FRIENDSHIP was the most popular selection for the global celebration which has become a key date on the international judo calendar. The #WorldJudoDay takes place on the same date every year as 28 October is the birthday of Jigoro Kano, the founder of judo. 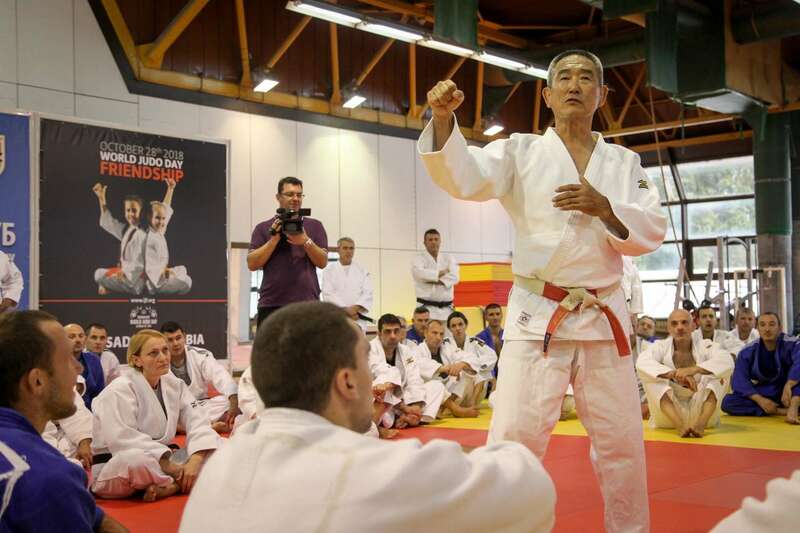 Today, more than 20 million people practice judo around the world on a daily basis. The #WorldJudoDay is the IJF showcase of the sport’s values and our spirit as judo is more than a sport. Judo is an educational tool that can help people to live together and to respect one another. The objective is to increase the number of judo players around the world and to help change people’s lives with the power of judo. Mr. Marius L. VIZER, IJF President, said: “The judo family has made an excellent choice by selecting Friendship as the theme this year. Friendship is the value which the world needs the most at the moment.” Watch all three days of #JudoAbuDhabi2018 live and free on the IJF website. -48kgWorld number three MUNKHBAT Urantsetseg (MGL) is the top seed in the lightest weight category of the competition. The Mongolian, who is ranked third in the world, finished fifth at the World Championships in September. Five-time Grand Prix winner MUNKHBAT will be aiming for her first gold medal since the Tashkent Grand Prix a year ago. World bronze medallist GALBADRAKH Otgontsetseg (KAZ) and Olympic champion Paula PARETO (ARG), who won the Cancun Grand Prix two weeks ago, will also be in action on Saturday. -52kgOlympic champion Majlinda KELMENDI (KOS) returns to action after a year on the sidelines through injury. KELMENDI has slipped down to 29th place in the world on the IJF World Ranking List after missing the majority of the 2018 season but has been back in training for several months. The Kosovo star is an eight-time Grand Prix winner and will be determined to make a triumphant return. Zagreb Grand Prix bronze medallist Angelica DELGADO (USA) is the number one seed and should challenge while Cancun Grand Prix bronze medallist Evelyne TSCHOPP (SUI) is in-form and could be in contention in Abu Dhabi. -57kgEuropean champion Nora GJAKOVA (KOS) leads the -57kg category into action this weekend. The world number four is the top seed at -57kg but last medalled on the IJF World Judo Tour in April when she won the Antalya Grand Prix. World number six Theresa STOLL (GER) took silver at the Budapest Grand Prix and finished fifth at the World Championships in September while Asian Games bronze medallist LIEN Chen-Ling (TPE) and Olympic bronze medallist Telma MONTEIRO (POR) are also both capable of winning gold. -63kgOlympic champion Tina TRSTENJAK (SLO) won bronze at the World Championships and starts as the favourite for -63kg gold. Six-time Grand Prix winner TRSTENJAK last claimed gold at the Tunis Grand Prix in January and is one of the most consistent performers in the sport. The world number two won bronze at the World Championships and the second bronze medallist from Baku, Juul FRANSSEN (NED), will also be present in Abu Dhabi along with world number six Martyna TRAJDOS (GER) who finished fifth in Azerbaijan. -70kgWorld number four Anna BERNHOLM (SWE) is the number one seed in the -70kg category. BERNHOLM won gold at the Antalya Grand Prix in April and could be in the mix in the final block. Zagreb Grand Prix bronze medallist Assmaa NIANG (MAR) and Budapest Grand Prix silver medallist Sanne VAN DIJKE (NED) will be tipped for honours along with Olympic bronze medallist Sally CONWAY (GBR). Two-time world medallist Maria BERNABEU (ESP) could be in line for a timely medal push having fallen down to 20th place on the IJF World Ranking List. -78kgTop seed Guusje STEENHUIS (NED) earned a career-best silver medal at the World Championships in Baku and must now follow up with a second Grand Prix gold medal. STEENHUIS, who lost to Japan’s HAMADA Shori in the final, has medalled at her last seven events and starts as the red hot favourite for -78kg gold on Monday. World number three Natalie POWELL (GBR) missed the podium in Baku and finished seventh at the Cancun Grand Prix last time out. Former world bronze medallist POWELL won gold in Abu Dhabi last year and will be expected to rediscover her form in the U.A.E. Germany’s 18-time Grand Prix medallist Luise MALZAHN and former Hohhot Grand Prix winner Bernadette GRAF (AUT) will also be worth tracking on the last day of competition in Abu Dhabi. +78kgNumber one seed Iryna KINDZERSKA (AZE) finished seventh at her home World Championships last month but will be backed to win her first Grand Prix title for Azerbaijan on day three in the U.A.E. The 2017 world bronze medallist, who is ranked seventh in the world, will feature alongside Olympic bronze medallist Anamari VELENSEK (SLO), Paris Grand Slam silver medallist WANG Yan (CHN) and Ekaterinburg Grand Slam bronze medallist Carolin WEISS (GER). -60kg World Championships bronze medallist Amiran PAPINASHVILI (GEO) is the top seed in the men’s lightest weight category. PAPINASHVILI has a first round bye but will meet either Abolfazl MAHMOUDI (IRI) or Olympic champion Beslan MUDRANOV (RUS) in the second round with the Rio 2016 winner being unseeded. 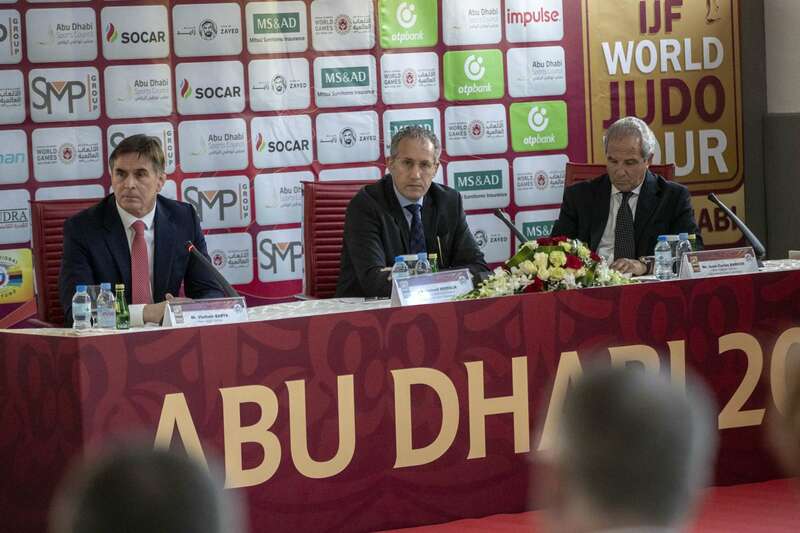 World Judo Masters silver medallist Francisco GARRIGOS (ESP), former world champion Yeldos SMETOV (KAZ) and Paris Grand Slam silver medallist Sharafuddin LUTFILLAEV (UZB) could all provide fireworks on day one. -66kg Tbilisi Grand Prix winner MARGVELASHVILI Vazha (GEO) fell short in his recent efforts at the World Championships and European Championships and will be hoping to resume normal duty in Abu Dhabi. The world number four is a three-time Grand Prix winner. Ekaterinburg Grand Slam silver medallist Yakub SHAMILOV (RUS) and World Judo Masters bronze medallist Baruch SHMAILOV (ISR) could both enter the medal equation at -66kg. -73kg Defending Abu Dhabi Grand Slam winner GANBAATAR Odbayar (MGL) will hope to star once again in the biggest weight category of competition. Despite there being 43 judoka in the weight category, GANBAATAR will hope to improve on his run of fifth-place finishes at his last five events. Cancun Grand Prix gold medallist Tommy MACIAS (SWE) and Paris Grand Slam silver medallist Lasha SHAVDATUASHVILI (GEO) are both medal candidates in addition to Paris Grand Slam winner Akil GJAKOVA (KOS). -81kg World champion Saeid MOLLAEI (IRI) will wear his red backpatch for first time and will start his competition in the second round against Jack HATTON (USA). World number one MOLLAEI won all five of his contests in Baku in a mercurial display and will be the man to beat in Abu Dhabi. Cancun Grand Prix bronze medallist Frank DE WIT (NED) and European Championships bronze medallist Aslan LAPPINAGOV (RUS) will be fancied for honours while Tokyo Grand Slam bronze medallist NYAMSUREN Dagvasuren (MGL) will be a leading threat for Mongolia. -90kg Ekaterinburg Grand Slam winner Aleksandar KUKOLJ (SRB) is the top seed in the -90kg category. The world number two has won one Grand Prix and needs to take gold to solidify his grip of the category. Budapest Grand Prix winner TOTH Krisztian (HUN), Asian Games bronze medallist USTOPIRIYON Komronshokh (TJK), former world champion Nemanja MAJDOV (SRB) and European champion Mikhail IGOLNIKOV (RUS) add world-class quality to the -90kg division on the last day. -100kg World number six Jorge FONSECA (POR) starts as the top seed in the -100kg category and will be hoping to convert that billing into top spot on Monday. The six-time Grand Prix medallist has never won an IJF event and now is the time to grasp elusive medals as the race for Tokyo 2020 qualification hots up. Cancun Grand Prix silver medallist Laurin BOEHLER (AUT) and Rio 2016 Olympic silver medallist Elmar GASIMOV (AZE) add further depth to a weight division which is bursting with talent. +100kg Olympic champion Lukas KRPALEK (CZE) won the Cancun Grand Prix last time out as he returned to winning ways following a disappointing fifth-place finish at the World Championships last month. World number two KRPALEK will start his day in the second round of the heavyweight category against Galymzhan KRIKBAY (KAZ). KRPALEK can expect another testing day with leading names and talented newcomers featuring alongside him including Cancun Grand Prix bronze medallist Tamerlan BASHAEV (RUS), Rio 2016 Olympic bronze medallist Or SASSON (ISR), Antalya Grand Prix winner Inal TASOEV (RUS) and European Championships bronze medallist Henk GROL (NED).